A playable demo of the upcoming alternate-reality FPS Turning Point: Fall of Liberty is now available on Xbox Live. Set in the U.S. in 1953, in a parallel universe in which the Third Reich won World War II, Turning Point: Fall of Liberty opens with a massive onslaught against New York city by Nazi jets, Zeppelins and attack blimps. As the attack intensifies and the city is hammered, gamers will take on the role of Dan Carson, a construction engineer at work on a new skyscraper. Players must flee the dangerous heights of the building as it comes under attack, ultimately engaging, disarming and dispatching Nazi paratroopers as they descend on the building. The full game will go beyond the attack on New York as the unstoppable German war machine occupies the United States as well as Europe, casting players into an epic struggle for freedom in an all-new World War II. Players must survive the initial invasion before regrouping with their fellow resistance fighters to take the fight back to the enemy, employing guerrilla tactics against the overwhelming might of the invading Nazi juggernaut. 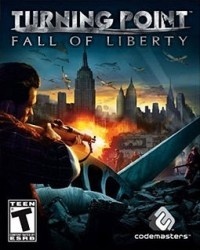 Developed by Spark Unlimited and published by Codemasters, Turning Point: Fall of Liberty is rated T (Teen) and scheduled for release in the first quarter of 2008 on the PC, Xbox 360 and PlayStation 3. More information is available at www.turningpointgame.com.